Leading Tory Brexiteer Jacob Rees-Mogg has denied he will “fling” dead fish into the water from a fishing boat on the Thames in protest of the government “selling out” Britain’s fisheries in the latest Brexit agreement. Mr. Rees-Mogg did not, however, deny he would be vocally opposing the deal, after reports suggest he would join Tory MPs including Craig MacKinlay and Sheryll Murray, in scenes reminiscent of the ‘Battle of the Thames’ ahead of the Brexit vote. “Am I going to change my name to Captain Haddock? I’m not throwing fish anywhere, I’m not a fish thrower. I think this has got slightly out of hand,” he told LBC radio Tuesday morning. 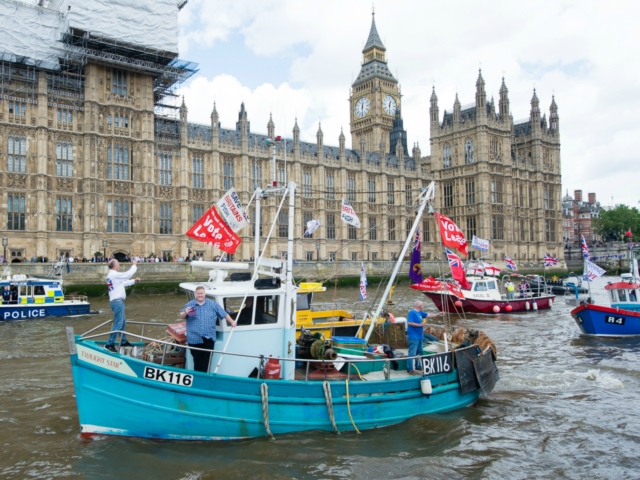 The proposed protest, organised by Fishing for Leave, is designed to highlight Prime Minister Theresa May’s “betrayal” of the promise to take back control of fisheries policy after Brexit, and the wasteful, unfair nature of the European Union’s (EU) Common Fisheries Policy (CFP). According to FFL, around 60 per cent of the UK fleet has been scrapped thanks to the CFP, which the UK is now likely to remain tied to for two years after Brexit. Currently, the CFP means EU boats can catch more fishing in UK waters that British boats – 760,000 tonnes – while British boats are entitled to just 90,000 tonnes of fish in the waters of all other EU nations. CFP quotas are likely to become even more punitive for British boats during the transition period, as the UK will be merely “consulted” by EU bureaucrats on setting them, Brexit secretary David Davis revealed Monday. Alan Hastings, a spokesman for FFL, told The Telegraph: “This is a death sentence for what is left of the EU fleet because the EU will enforce detrimental legislation, especially the discard ban, to cull the EU fleet and then claim the resources we can’t catch any more as their own. He added that the protest was necessary because “being trapped in the transition is an existential threat and a potential death sentence for what is left of the UK fleet”. Mrs. May is currently leading a minority government, and a number of pro-Brexit and Scottish MPs have already threatened to rebel over this issues, which could stall the entire Brexit process. Leader of the Scottish Conservatives Ruth Davidson said she would back a rebellion led by John Lamont MP, warning Mrs. May that Scotland’s 13 Tory MPs could oppose any Brexit deal that “fails to deliver full control over fish stocks and vessel access”.